Today is Thursday and I want to confess one of my sin I have committed. You know that thing my Sai and I feel so guilty that please punish me for whatever I have done but please don’t let me go and always be in my heart and remain a part of my inner soul. I am not asking for forgiveness but asking for your company forever till the end of this journey of my life. I accept my sin in your feet. Ravi, my dearest brother, whatever it may be you have done, you are under OUR BELOVED BABA SAI's special care. Never will He let go of you. He was, is and will be with you always and HE LOVES YOU. May SAI's lovelight waterfall wash all your sins (and your guilty feelings) away. Its common that every one commits mistakes but confessing your sin shows that you love baba and respect him in every possible way. Baba needs nothing more than this and he will never stop loving you nor will he never leave you. Baba is beyond our imagination and his love for all of us is never ending. Its just that we all think Baba to be our friend, father, mother, lover, God, Saint, etc.. But he is beyond this and is more closer to us than these relations. I am sure Ravi Bhai he will never desert you for you are his blessed child. Awareness means that the total mind has become aware. Be aware - so don't be afraid of the word beware, just be aware, and the moment you are aware you have come home. I know its very hard to overcome; my sins will live with me. YOU ARE ALWAYS UNDER OUR SAI'S UMBRELLA.DON'T WORRY. HE KNOWS EVERYTHING AND HE WILL TAKE CARE. WHICH IS JUST WAITING FOR YOU TO START. You are truly blessed by our Baba Sai,which is very much evident and seen by all of us that you are the architect of this awesome online mandir which gives so much solace,peace of mind, hope,assurance,blessings to lots and lots of people round the world.Even if feel that you have sinned(which is not so) everything has been washed away without any trace.Our Babaji has fed everything to the Dhuni. Ravi Bhai Aaisa Mayoos Hone ki Zarroorat Nahi Hai. Sab Chalta hai. Aabi Toh Zindagi Ka Pahala Kadaam Hai. Be brave and face it. No need to dishearten. Things will settle on its own. You just move on! BABA talaash liyaa, aaur Bandagee Kar Lee. 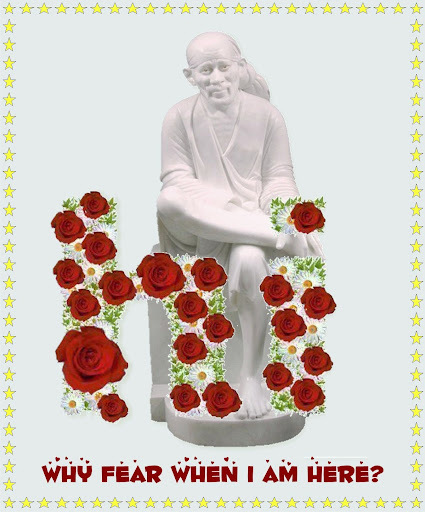 MAY BABA SAI BLESS MY DEAREST RAVI. Dear Baba....please bless our dear Raviji with lots of happiness. Raviji, all of us have made mistakes. Once we realise them and regret for it whole heartedly, Sai will surely forgive us. And HE is always with you and will always be with you no matter what. One will be great if he realises his mistakes.Greater when he repent for them and greatest when he never commit them again.We are in the shadow of baba.we need not worry for any thing as we are under his vigilent watch.